‘Josh’ is a rather energetic hybrid of darcyii (oresbia) and maybe a microphylla. It originated in Australia in Queensland. 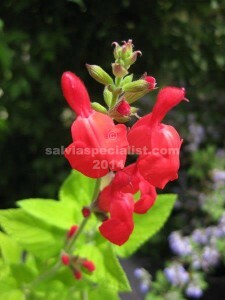 It is bright luminous red and extremely colourful for months in summer and autumn. There are similar sorts of crosses overseas. ‘Josh’ needs a cutback to keep it contained or let it go depending on your preferences. It grows about a metre high. It will die back for the winter when it is very cold. A similar sort of plant is grahamii or elegans if you are up to date with names. It can be grown easily from cuttings.